Like many artists, Callum Dale took a circuitous route to finding his true passion. 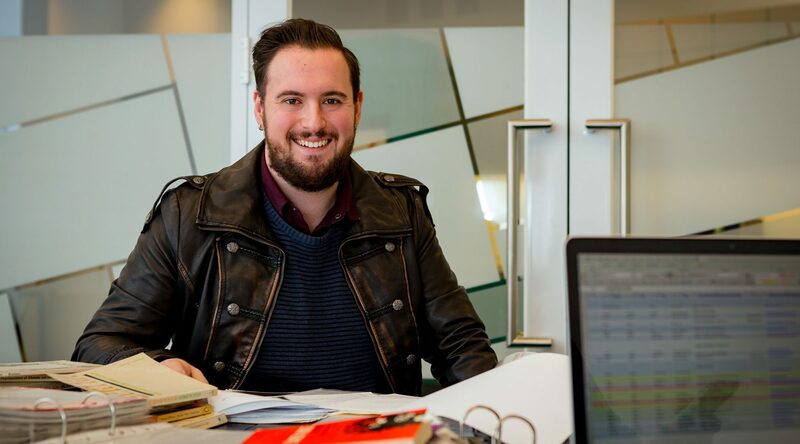 Now a recent Master of Dramaturgy graduate, he reflects on his experience at the Victorian College of the Arts and how he is preparing for the career ahead. Not all who wander are lost – and I’ve definitely my fair share of wandering. Like most high-school theatre enthusiasts, I graduated with the ambition of becoming an actor. Having established a small independent production company with friends to explore our own artistic and creative interests, I enjoyed a couple of years of producing and creating theatre in an ensemble-based practice. I then started a Bachelor of Arts in Acting at the University of Ballarat’s Academy of Performing Arts and, while I thoroughly enjoyed my time there, I knew that this was no longer the career path for me. I left at the end of first year, and then spent some time aimlessly wandering through part-time jobs and tertiary courses looking for a new career. In 2011, in attempt to jumpstart my creativity, I moved to Sydney to complete a Masterclass Certificate in Makeup and Special Effects, but breaking into the makeup and special effects industry proved almost impossible, so I began studying a Bachelor of Arts in theatre and history at Monash University. That’s where my journey to a career in dramaturgy really began. At the end of my course, having finally completed an undergraduate degree and having worked with numerous artists and companies, I applied for the Master of Dramaturgy at the VCA. I think it takes a quirky and “different” individual to have a passion in dramaturgy, and after many years of searching, I finally found the shoe that fit. I remember when the course was first announced I received an email from one of my undergraduate mentors telling me they’d found “a course made for people like me”. A Master of Dramaturgy had interested me for a few years and I now had the opportunity to study at a highly-regarded and prestigious Australian institution. The course is the only one of its kind in the southern hemisphere and could have a real impact on the Australian performing arts industry in the next few years. No two days at the VCA were ever the same. A one-year master’s degree moves fast and demands a strong work ethic and high level of discipline. Mondays were generally our day off, and a good time to catch up on reading and earn some money. The rest of the working week comprised two three- or four-hour classes a day. These classes could be lectures and tutorials, discussion-based seminars, practical workshops, or rehearsals. I find the more I work, the more I am inspired. To be actively engaged in an exciting rehearsal space or riveting production company is as inspiring as it gets for me. Whether it be on new writing or a time-tested play, a raucous comedy or moving tragedy, dance, music, theatre or avant-garde performance, the discussions surrounding rigorous, relevant and thoughtful work drive me to work harder and more passionately. As a dramaturg you are often the middleman: as the mediator between directors, writers, designers and other creatives, you’re ultimately the advocate for the work itself. The VCA’s cross-disciplinary classes and practise models definitely prepare you for this role as you become an expert in communication. But I think the biggest challenge for a dramaturg in any situation is learning your role in any given circumstance. You have to be constantly adaptable. When you’re studying, you’re constantly working with fellow practitioners and creating, or at least theorising, arguably the most daring and experimental work of your career. You are uninhibited by the constraints and pressures of professional work. I think the rare opportunity to be creative with like-minded people is often taken for granted – it’s the continual artistic expression and discussion that you miss most once you leave. While I was a Master of Dramaturgy student, I was fortunate enough to complete two internships with the Melbourne Theatre Company (MTC). Those were made possible by VCA’s strong connections with MTC – many of the VCA’s sessional lecturers work at or with the company. My first internship was with MTC’s Literary Manager Chris Mead on the selection and curation of Cybec Electric 2017. This internship opened the MTC’s doors to me. I gained a deeper understanding of professional practices and the process of programming while refining my skills in play-reading and assessment. Alongside that internship, I completed a directorial secondment under Peter Houghton on the mainstage production of Neil Simon’s The Odd Couple. An invaluable experience, the secondment involved observing readings, rehearsals, production meetings, costume fittings, bump-in, technical and dress rehearsals, preview performances and opening night. Ultimately, the achievement of writing a 10,000-word thesis to accompany the project was extremely satisfying and has inspired me to continue studying in the future and hopefully one day commence and complete a PhD. Dramaturgy is a growing field in the performing arts industry but jobs are scarce and the industry is extremely competitive, so you need to be resilient and, in a sense, have a thick skin. You need to be prepared to work jobs that at times may seem unrelated to the field. But you should always be assessing the dramaturgical processes in motion, and identifying how the various elements of production affect one another. You have to remember too that your skills and knowledge are ever-expanding and can be refined as you continue to work with various practitioners and companies. The VCA gave me the knowledge, skills and experiences necessary to enter the industry as a respected emerging practitioner. It also widened my network to include people from mainstage companies and other industry organisations, and in the extremely competitive performing arts industry, your network is always your strongest ally and source of work. The continued support and mentorship from my tutors and lecturers has been comforting on the road to a challenging career. – As told to Sophie Duran. Banner image: Callum Dale. By Sav Schulman. Applications for the 2018 intake of the Master of Dramaturgy close on 31 October, 2017. Visit the VCA website to find out more. Read more VCA & MCM Student Stories. Sign up for the Faculty of VCA & MCM’s free monthly enews.